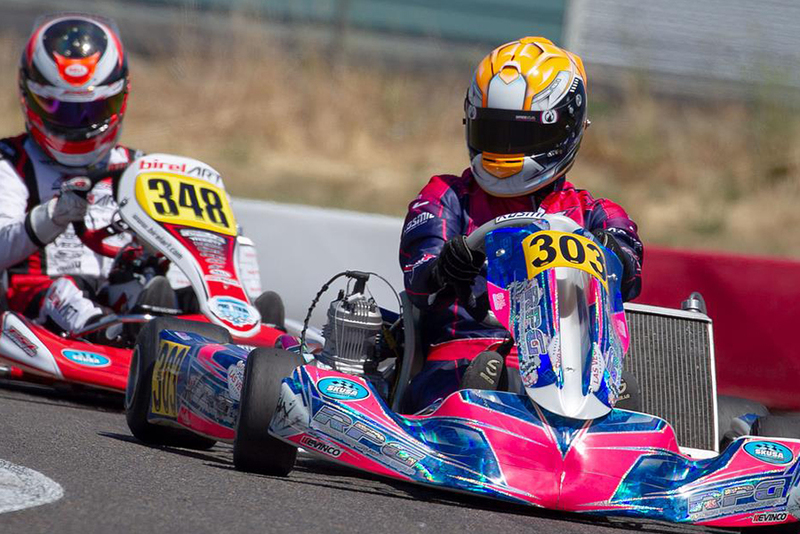 The summer season is here, and regional racing across the United States is in full motion for the Superkarts! USA organization. The last program to get the 2018 year launched is the Can-Am Karting Challenge, the premier racing series in the Pacific Northwest. 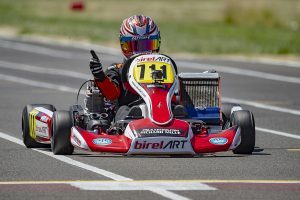 Round One and Two brought competitors to the Portland Karting Association’s McMinnville Kart Track, also known as ‘Mac Track’, in the heart of McMinnville, Oregon on June 22-24. Roughly 75 entries took part in the two rounds of racing on the weekend around the 6/10-mile course built in 2001. Great support from teams and drivers throughout the region, along with a production team from SKUSA hired to conduct the series, the event was a success from start to finish. Over 20 drivers made up the Shifter race group, thanks to the cooperation of the O2S Championship joining the Can-Am program on the weekend, featuring the four categories for 2018. Spec Honda Senior was the largest at nine drivers, dominated on the weekend by two SKUSA Pro Tour standouts. Cameron Egger and Kyle Wick split the victories. Wick set fast time on Saturday by 83 thousandths over Egger with a 38.730-lap. Unable to complete a lap in the Prefinal, Egger led wire-to-wire for the race win before duplicating the feat in the Final. Mathew Morgan and Joe Criscione completed the podium. Wick bounced back from his troubles on Saturday to sweep Sunday’s action. The SKUSA Pro Tour SpringNationals winner went wire-to-wire on the day, capping it off with a 2.6-second victory over Egger with Morgan on the podium once again in third. The Open Shifter Senior class was split between James O’Brien and Andres Frato. The Spec Honda Master category saw the top spot change nearly every session. Saturday ended with Rich Jerrett outlasting the field for the victory with top qualifier Thomas Welch in second and Prefinal winner Bryan Stauffer in third. On Sunday, Ben Johnston joined the battle, bouncing back from a DNF in the Prefinal to record a two-second victory in the main event over Prefinal winner Rusty Lingle. Jerrett rounded out the podium. Carl Beavers and Brian Nixon were the two different winners in Open Shifter Master. Beavers bested Wayne Mayo on Saturday while Mayo was again runner-up on Sunday with Beavers in third. Luke Selliken defended his home turf on the weekend, sweeping both rounds in the TaG Light division. Selliken had a number of top drivers from the region to contest, along with eKartingNews.com TaG Driver Rankings Powered by Bell Racing USA #1 driver Ryan Norberg up from Florida competing. Selliken grabbed fast time in qualifying and led all 15 laps of the Prefinal. Norberg got the jump on Selliken to begin the 25-lap Final, with Luke taking back the lead on lap six to stretch away for a 3.4-second victory. Norberg settled for second with Kyle Wick in third. 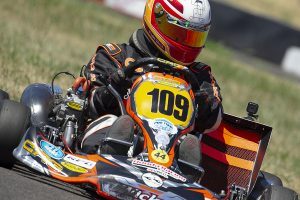 Adam Smalley and two-time SKUSA Pro Tour Master champion Derek Wang completed the top-five. Norberg tried again to take down Selliken on Sunday, and was unable to. Norberg led early in the Prefinal before Selliken reclaimed the spot and the race win. Selliken held off Norberg early in the Final, leading all 25 laps for his second victory. He and Norberg were joined on the podium by Edward Portz in third, with Wick fourth and Jacob Gulick in fifth. The Mann brothers Sean and Christopher split the victories in the TaG Heavy category. Sean was able to score the Sunday main event win over Chad Wallace and Rene Bine. Christopher showed up Sunday and swept the day. Sean ended up second with Wallace on the podium for a second time as well, placing third. The big winner on the weekend was Cadet racer Graham Trammell. Pulling double duty, Trammell won both main events in the Micro Swift division, and won each Final in the Briggs 206 Cadet class. 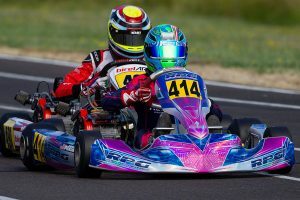 Trammell went wire-to-wire in the IAME class, with the podium the same both days as Lucy Becklin was second and Riley Allen in third. Parker Sellner broke up the perfect weekend for Trammell in the Briggs class, setting fast time in qualifying on Saturday. From there, Trammell won the Prefinal and Final with Sellner second, posting fast lap of the race, and Greyson Shobert in third. Trammell swept Sunday’s action with Sellner winning the battle for second ahead of Lucy Becklin. Josh Pierson pulled off a double-win weekend in the Junior ranks, taking one in the X30 Junior category while earning a second on Saturday in the Briggs 206 Junior class. 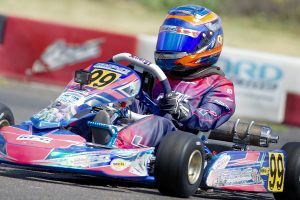 The X30 Junior division featured six talented drivers. Cooper Becklin set the pace both days in qualifying, coming out strong on the new Evinco Tires. Pierson was third in Saturday’s session behind Jonathon Portz, running fast laps of the Prefinal to work past both for the race win. He then went on to establish a 3.4-second advantage in the Final over Portz and Becklin. Pierson suffered an injury and sat out Sunday. Portz took advantage to win both the Prefinal and Final over Becklin with Caleb Shrader in third. Pierson outlasted Becklin in the Briggs class on Saturday with Bryson Smith in third. Portz took over the Briggs machine for Pierson, coming up short as Becklin swept the day. Becklin took the victory, edging out Smith by 84 thousandths at the line. Portz crossed the line in third but was penalized two spots, moving Jake Sessler to third. Three different Egger brothers won on the weekend. Cameron’s win was complimented by a win for Dalton and Brady Egger in the Briggs 206 Senior division. Dalton was able to secure the victory on Saturday after an epic battle. Jacob Gulick was the top qualifier and Prefinal winner, joined by Egger and Tyler Besuyen at the front of the field. On the final circuit, Dalton went from third to first and was able to cross the line for the victory. Besuyen was second with Gulick third. Brady was just one spot off the podium with Ryan Casner in fifth, up five spots from 10th on the grid. Gulick was once again the driver to beat on Sunday. setting fast time in qualifying and winning the Prefinal. Gulick remained in the lead for the first 24 laps of the Final with Brady on his bumper. Another last lap pass dropped Gulick out of the lead, this time with Brady enjoying the checkered flag. Dakota Grindland joined them on the podium in third with Besuyen and Jeff Lewis completing the top-five. Bryan Green won the Briggs 206 Master division on Saturday over Greg Normandin. 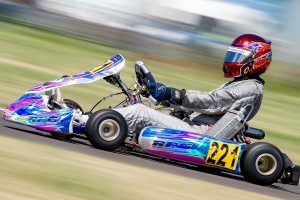 Next on the docket for the Can-Am Karting Challenge is a trip north of the border to the historic Greg Moore Raceway in Chilliwack, British Columbia on July 27-29. For more information regarding the Can-Am Karting Challenge, head to www.canamkartingchallenge.com and be sure to find them on Facebook, Twitter and Instagram.